St. Bernadette and Our Lady of Lourdes - BLIND FAITH LIVE!BLIND FAITH LIVE ! Real People. Real Miracles. April 16 is the feast day of St. Bernadette. How many millions of people have made the trek to Lourdes, France, in search of a miracle? 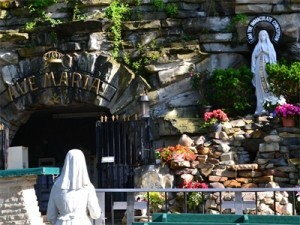 Thousands more have visited our local Our Lady of Lourdes Shrine in nearby Euclid, Ohio. Sandy and Paul had traveled hundreds of miles in search of a miracle at the medical office of Dr. Issam Nemeh. Mission accomplished for Sandy and her battle with cancer. For Paul, her husband, the miraculous was a 30-minute drive away at the Our Lady of Lourdes Shrine. The vertigo issues that had plagued Paul were quickly washed away. This entry was posted in Dr. Issam Nemeh, Miracle Moments, Miracle Prayer and tagged Blessed Mother, Cancer, Saints, Vertigo by Philip Keller. Bookmark the permalink.